Automation is nothing new – machines have been replacing human workers at a gradual rate ever since the Industrial Revolution. This happened first in agriculture and skilled crafts like hand weaving, then in mass manufacturing and, in more recent decades, in many clerical tasks. As the extra income generated by these technological advances has been recycled into the economy, new demand for human labour has been generated and there have, generally, still been plenty of jobs to go round. But a new generation of smart machines, fuelled by rapid advances in artificial intelligence (AI) and robotics, could potentially replace a large proportion of existing human jobs. While some new jobs would be created as in the past, the concern is there may not be enough of these to go round, particularly as the cost of smart machines falls over time and their capabilities increase. There is an element of truth in this argument, and indeed our own past research suggests that up to 30% of existing jobs across the OECD could be at potential risk of automation by the mid-2030s. But this is not the whole truth for two main reasons, which we explore in detail in recent research published for the UK and a new report on China which will launch at the World Economic Forum’s meeting in Tianjin in September 2018. Firstly, just because a job has the technical potential to be automated does not mean this will definitely happen. There is a variety of economic, political, regulatory and organizational factors that could block or at least significantly delay automation. Based on our probabilistic risk analysis, our central estimate is that only around 20% of existing UK jobs may actually be displaced by AI and related technologies over the 20 years to 2037, rising to around 26% in China owing to the higher potential for automation there particularly in manufacturing and agriculture. We refer to this as the ‘displacement effect’. Secondly, and more importantly, AI and related technologies will also boost economic growth and so create many additional job opportunities, just as other past waves of technological innovation have done from steam engines to computers. In particular, AI systems and robots will boost productivity, reduce costs and improve the quality and range of products that companies can produce. Successful firms will boost profits as a result, much of which will be reinvested either in those companies or in other businesses by shareholders receiving dividends and realising capital gains. To stay competitive, firms will ultimately have to pass most of these benefits on to consumers in the form of lower (quality-adjusted) prices, which will have the effect of increasing real income levels. This means that households can buy more with their money and, as a result, firms will need to hire additional workers to respond to the extra demand. We refer to this as the income effect, which offsets the displacement effect on jobs. Our new research put some numbers on these job displacement and income effects for the UK, which we have found from past research is fairly typical of OECD economies as a whole; and China, the largest of the emerging economies. For the UK, the estimated net impact on jobs is broadly neutral, with around 7 million jobs (20%) projected to be displaced in our central scenario but a similar number of new jobs being created. More detailed analysis suggests significant net job gains in sectors like healthcare, where demand will rise due to an ageing population but where there are also limits to the scope for automation because of the continued need for a human touch. Significant job displacement in areas like manufacturing and, as driverless vehicles roll out across the economy, transport and logistics will offset these gains. For China, there is an estimated negative net impact on agricultural employment, continuing a long-standing trend, more than offset by large increases in construction and services. As for the UK, healthcare will be one area with considerable potential for net job gains given China’s rapidly ageing population. One result that might seem surprising is that the impact on jobs in China’s industrial sector is estimated to be broadly neutral. This reflects the fact that while there will be considerable scope for further automation in Chinese manufacturing as wages there rise, we also estimate that China will take the lead in manufacturing the AI-enhanced products (robots, driverless vehicles, drones etc) that will come out of this Fourth Industrial Revolution. 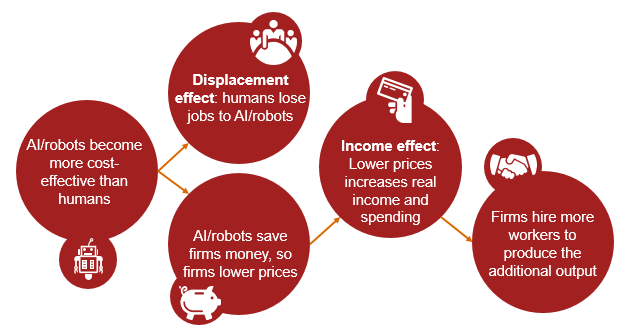 More generally, the huge boost to the Chinese economy from AI and related technologies, which we estimate could be more than 20% of GDP by 2030, will raise real incomes across the economy. This will create new demand for goods and services that will require additional human workers to produce, particularly in areas that are harder to automate. While our estimates suggest that fears of mass technological unemployment are probably unfounded, this is not a recipe for complacency. As with past industrial revolutions, this latest one will bring considerable disruption to both labour markets and existing business models. In China, we could see around 200 million existing jobs displaced over the next two decades, which will require workers to move to industry sectors and places where new jobs will be created. Of course, China has seen even larger movements of workers from the farms to the cities since the early 1980s, but the process will not be easy. Given China’s ageing population, an increase in immigration may be required to meet the demand for additional workers. Both government and business have a role in maximizing the benefits from AI and related technologies while minimizing the costs. The latter will require increased investment in retraining workers for new careers, boosting their digital skills but also reframing the education system to focus on human skills that are less easy to automate: creativity, co-operation, personal communication, and managerial and entrepreneurial skills. Businesses too have a role to play in encouraging a culture of lifelong learning amongst their workers. For government, AI will boost economic growth and, therefore, tax revenues. This should enable social safety nets, including state health and social care systems, to be strengthened for those who find it difficult to adjust to the new technologies. Such measures will be important if the huge potential benefits of AI and related technologies are to spread as widely as possible across society.